New troubles are piling up for U.S. banks as they prepare to release third-quarter results amid warnings of weak trading revenue, a sharp decline in mortgage-refinancing activity and rising legal costs. Analysts are scrambling to ratchet down earnings estimates ahead of the reports. J.P. Morgan Chase and Wells Fargo are slated to post results on Oct. 11, with Citigroup, Bank of America, Morgan Stanley, and Goldman Sachs due to weigh in the following week. Poor results could prompt additional job cuts and worsen the already downcast mood on Wall Street, bankers and recruiters said. "I haven&apos;t seen morale this bad since the Titanic," said Richard Stein, a senior recruiter at Caldwell Partners who specializes in financial services. As a Buddhist monk, Ashon Nyanuttara suppresses anger and frustration. Even so, he said he was disappointed on arriving in New York’s Battery Park yesterday only to learn that Statue of Liberty tours were canceled. “This is no good for public, especially tourists,” said Nyanuttara, 30, who is visiting from Myanmar, or Burma. “This is an American symbol. The government should keep it open.” The closures upended tourists’ plans and forced about 800,000 federal workers to take unpaid time off until the impasse is resolved. The partial shutdown will cost the nation at least $300 million a day in lost output, according to IHS analysts. The weeks of public wrangling between House Republicans and Senate Democrats that led to a government shutdown Tuesday lacked one element typical of previous showdowns: actual negotiations. Unlike in earlier standoffs, the two sides haven&apos;t engaged in tense, closed-door talks, nor has an unexpected savior swooped in to jump-start stalled conversations, as Vice President Joe Biden and Senate Republican Leader Mitch McConnell did late last year. Instead, the debate has unfolded in a volley of partisan bills. On Tuesday, there were few signs the posturing would end, with no formal talks scheduled and no obvious indications of who, if anybody, might step forward to bridge the differences. One juror seated at the federal court skirmish called the 55-year-old businessman a “nice guy,” a second said she was “impressed” at how he stood up for his beliefs, while a third said he was “leaning” towards Cuban’s version of events based on what he already knew about the case. Maria Bartiromo could be called as a witness in the nasty divorce of ex-Citigroup honcho Todd S. Thomson, who famously offered the Money Honey a ride on his corporate private jet, sparking rumors of an affair. Thomson — who was Citigroup CFO for five years CEO of Citigroup’s Global Wealth Management Division until he took CNBC doyenne Bartiromo to a 2007 event in Asia on Citi’s jet and then was fired — is in the middle of a bitter divorce with his wife of 25 years, ­Melissa, with whom he has three children. The Wall Street Journal reported at the time that Thomson, now founder and CEO of Manhattan-based private equity firm Headwaters Capital, bumped execs from the return flight so he might fly back alone with Bartiromo, bankrolled Citi functions and TV shows that featured her, and named the glamorous TV anchor to a board he created inside his alma mater, Wharton business school. Thomson insisted in 2007 that his relationship with Bartiromo, who is married to Jonathan Steinberg, was “appropriate.” But Page Six can now exclusively reveal that a Connecticut court has granted his wife Melissa permission to depose Bartiromo, 46, stating that “certain facts which are in issue, or which directly assist in proving the Plaintiff’s [Melissa’s] case, are within the knowledge or power of [Bartiromo].” Papers filed in Stamford, Conn., by Melissa’s lawyers claim that in April this year, Todd admitted to her “a base, immoral and disreputable act he had committed, and the sight of the Defendant [Todd] now disgusts and traumatizes the Plaintiff.” It is not believed this “act” refers to Bartiromo. Given the winless Jacksonville Jaguars&apos; standing as the unquestioned worst team in the NFL, it stands to reason that mascot Jaxson DeVille should refrain from betting on his team. And yet, for some reason, the Jaguars&apos; mascot agreed to a wager with the Indianapolis Colts&apos; mascot that the loser of Sunday&apos;s game would stand 10 yards in front of a paintball gun and be pelted with the number of paintballs equal to the total points scored. Since the Jaguars lost 37-3, Jaxson DeVille was forced to withstand 40 paintballs - and withstand 40 paintballs he did. Fielding complaints from borrowers struggling to save their homes, New York&apos;s top prosecutor is preparing a lawsuit against Wells Fargo, accusing the bank, the nation&apos;s largest home lender, of flouting the terms of a multibillion-dollar settlement aimed at stanching foreclosure abuses. The lawsuit, which is expected to be filed as early as Wednesday, accuses Wells Fargo of violating the guidelines of a broad agreement reached last year between five of the nation&apos;s largest banks and 49 state attorneys general. The federal government shutdown is already affecting contractors and threatens to dampen private-sector employment, at least in the near-term, industry officials say. Twenty-nine percent of contractors say a shutdown would cause them to delay planned hiring, and 58% said it would have a negative effect on their businesses, according to a survey of 925 contractors this week by the National Association of Government Contractors. The European Central Bank left its benchmark interest rate unchanged at a record low Wednesday, but it was likely to be keeping a wary eye on political turmoil in the United States. According to a source with knowledge of Rodriguez’s ongoing arbitration hearings, the embattled Yankee and his lawyers have presented a case based partly on the idea that Rodriguez believed the substances he procured from the Biogenesis anti-aging clinic were innocent legal supplements. Charter interested in Time Warner; HSBC whistleblower not finished here; Berkshire will probably buy a German company; No $6 mm home run bonus for A-Rod; Toilet beards; and more. 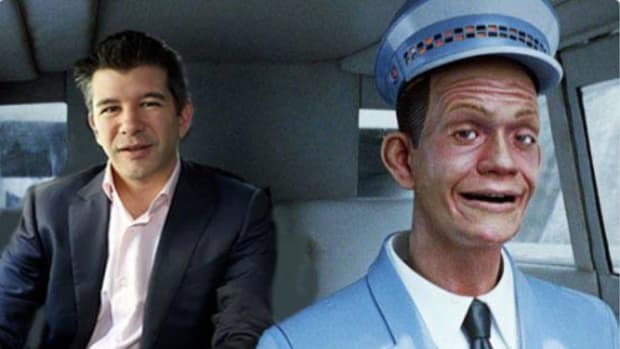 Uber board now trying to sue Travis Kalanick away; Wells Fargo board finally reshuffling; Venezuelan bonds are hot potatoes; Dan Loeb says something unfortunate; Fat monkey turns his life around; And more!